File Size: 21.38 MB; Tileable: Yes; DPI: 300 DPI; Dimensions: 12 x 12 in. A glimmering gold glitter effect adds to the glitz of these 12 bold, bohemian inspired patterns. These patterns are in my pretty Purple color theme. Each digital paper is seamless and high resolution, making them perfect for invitations, scrapbooking, or even webpage backgrounds. Download is 1 zip file which includes. Want to use this for commercial work? My Make It Easy License is Included with this Art! In addition to the Simple License, my art comes with my Make It Easy license for small commercial work. This means you may use this art in personal projects, designs for clients, or for small runs of finished goods you sell, as long as the art makes up less than 75% of your total design. Like my work? Find freebies, coupons, tutorials and more from Amanda Ilkov on my blog. 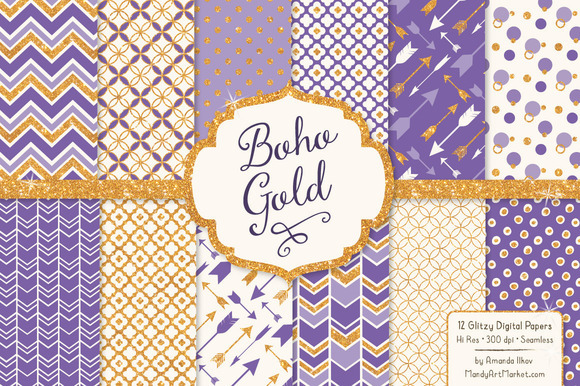 Keywords: bohemian pattern, bohemian digital paper, gold glitter, glitter digital paper, glitter patterns, gold glitter patterns, glitter chevron patterns, arrow patterns, seamless glitter, tileable patterns, tileable pattern, scrapbook paper, scrapbook papers, boho gold, glitter dots, glitter papers, style1064, wedding glitter, colorpurple, purple glitter.